Venice is full of commonplaces: love, gondolas, Rialto and nice sunsets are the most abused stereotypes about this fantastic city. However, as Nancy Kress stated: “A stereotype may be negative or positive, but even positive stereotypes present two problems: They are cliches, and they present a human being as far more simple and uniform than any human being actually is”. 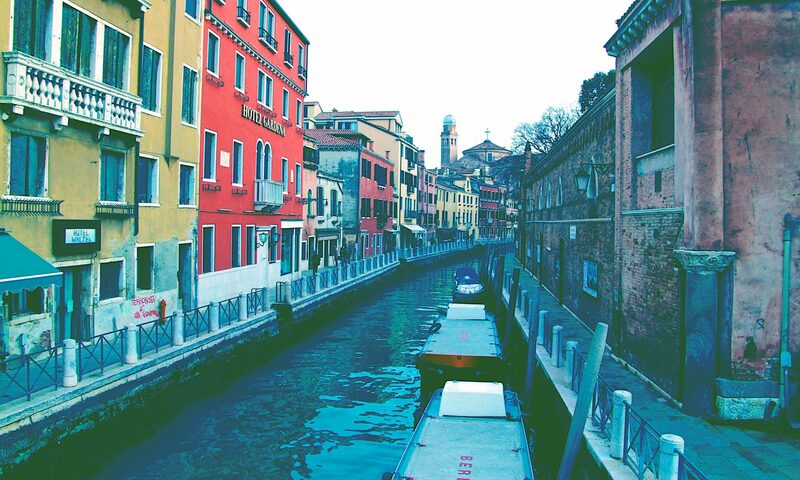 It is too simple and too easy to say that Venice is the city of love. It would be better to say that Venice can be the city of love, when experienced correctly, when people know and appreciate its most intimate essence. Otherwise, it is difficult to live the real nature of this town. In some ways, it would be like driving a Ferrari without a driver’s license: the results would be worse than with any other car. For centuries, Venice has been famous for parties. Casanova was an illustrious representative of this side of Venice, even the Carnival and the masks were instruments to implement any wildest fantasies. Love came later. Someone would say that love is a feeling from the XIX century. However, love is where fun and passion meet. When there is love, these feelings can only walk together. And Venice is passion, love and fun. Passion cannot be explained, it must be experienced with every sense. The sunsets visible from Zattere area, the plays of light in front of Punta della Dogana, the delicate noise of the canals and even the light wind surrounding San Marco: these are examples of what passion means for me. The fun comes from the amazing wine of the Bacari, in the most irreverent spirit of the carnival, during Spritz time in Campo Santa Margherita, without neglecting the most spiritual part that always comes together with the most important events, one of all: the Redentore. When it comes to love, passion and fun are its necessary ingredients. Almost an Aristotelian syllogism that is particularly evident in Venice. Not to bring back to science what it is not science, it is just an attempt to explain, if there were any reason or need, because of all the cities, Venice is the queen of love. Only those who can grasp these different elements, that both alone and together make up the very essence of Venice, that being “love”, can really take advantage of it. Only then it is possible to perceive what Venice is: a privilege for few. Now, for good reasons, you will say: “All good, but with a girl in Venice, what do you do?”, That’s why we decided to ask the ideal meeting to five girls. Stay tuned!